When you load an animation, Golaem will automatically embed it inside a Motion Clip. 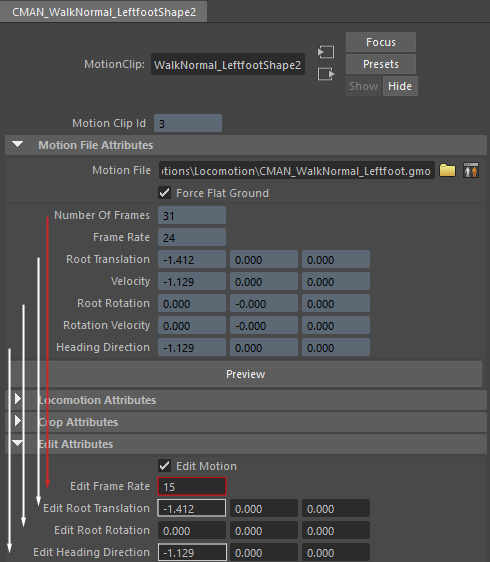 Check the "Crop Motion" checkbox and fill in the Start / Stop Frame. Obviously Stop frame needs to be greater than Start frame. This is very useful when you want to use only a part of a Motion and do not want to spend time editing it in the character maker. For example you can take only the "Wave arms" part of a sit-to-wave motion. The Motion Clip edits in this page are a bit extreme for illustration purposes, and as you can see they can affect the final animation quality. Usually the will be used only for a small correction. Also note that the same parameters can be found in the CharacterMaker when importing a motion, with the added advantage that the CharacterMaker has some Blend Attributes which enable to choose where to affect the motion and to ensure it loops. The Frame Rate attribute can be used to change the replay speed of an animation. Note that the same effect can be achieved by using the Speed Ratio attributes on a Motion Behavior, or the Ratio attribute on Locomotion Behavior. Of course if the replay ratio is very high or very low, it can generate an unrealistic animation, but it is sometime the needed effect. In most cases, the root is aligned with the overall motion direction. However sometimes you can have an animation where the root will be oriented differently. In these cases, it is possible to edit the heading direction to help Golaem move your character in the right direction.